Rock Brothers have been selected for inclusion in C.O.C.A. 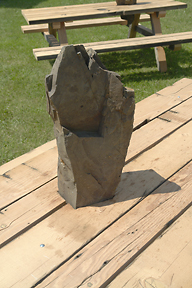 's Outdoor Sculpture Park. Opening of "Heaven & Earth" at Seattle's Carkeek Park is on June 27th from 3 to 5pm. 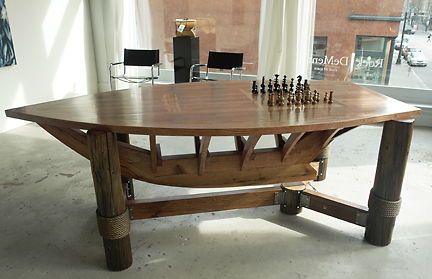 Executive Decision is a dining table made of salvaged ash. Hand crafted with a modern design, the uncured wood was allowed to warp when drying. The table was then altered by driving a large wedge of rough wood through the surface to create an artistic statement about the choices we make and why. 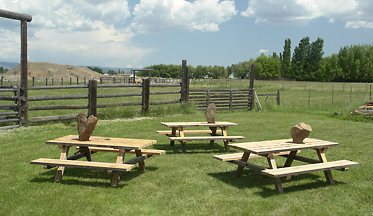 Three additional picnic tables will be placed at equal distances around the central piece. 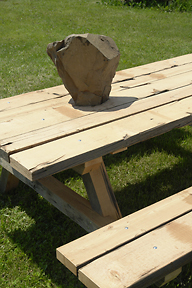 Each of the picnic tables have landscape sized boulders placed into cutouts on top of the tables. This creates an additional scale to the installation and pushes the conversatio regarding how issues, once laid on a table, can hardly be ignored. Now showing at Rock|DeMent in Seattle's Pioneer Square.